I want to hear about new music and cool shows! 1, 2, 3, 4, who’s punk, what the score? Is that Black Flag guy really suing the FLAG guys? What is that about? It’s bad enough we live in a world of dub step, Kim Kardashian and reality shows. I don’t want to hear about our punk godfathers suing their own people. I want to hear about new music and cool shows. I am looking forward to a few good shows coming up. 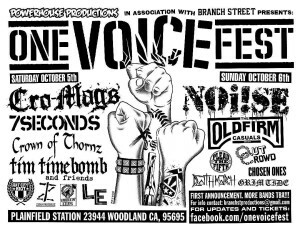 Final Conflict is playing this weekend in L.A. at the Echo, the Nardstock show is next weekend and I just heard about the ONE VOICE FEST up near Sacramento, CA. featuring 7Seconds and Cro-Mags (see flyer below). Good stuff going on! This month has some great stuff coming to you from ClassicPunk. I am gonna finally post my interviews with Steve Soto from Adolescents and Jim Lindberg from Pennywise. Also gonna do some album reviews, show reviews and general babbling about various bands and old school punk junk. One thing I am planning in the babbling department is my recent and ongoing obsession with NOFX. I am also working on a few lists. One of them is top 10 songs I wish I wrote! Should be fun for some and will bore the girls to death! !